This ingenious invention was posted way back in 2010 as one of my kitchen must-haves. It still makes the list and I get giddy every time I see one in a friend’s kitchen. 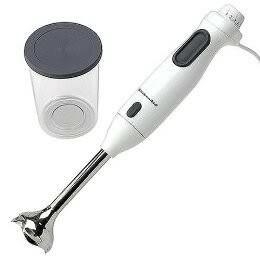 I use my immersion blender mainly for soups. Before I acquired mine, I used to have to let my soup creation cool, then blend in batches in the blender. And when soup is being made, I’m a pretty impatient person. Now, I just turn off the heat to my pot, stick this baby in and go to town. Voila! Instant creamy soup. Seriously. It makes things creamy. Like this tomato soup I make? There is zero cream in the recipe but once I blend it with the immersion blender, it gets all thick and velvety. It’s nothing short of a miracle. My friend, Coop, who did the color run with me, has one that she uses to whip up protein shakes. It creates less mess than a blender and you can whirl a shake up in half the time. All you have to wash is the blade of the blender and your cup! Thanks, immersion blenders, for making our lives easier, our kitchen sinks less full and soup-making more fun. Do you have an immersion blender? How much do you love it? What do you use it for?